The historic St. Louis Union Station Hotel will be the site of the 19th AAC. A variety of issues including possible themes and youth participation related to the Orthodox Church in America’s 19th All-American Council [AAC] topped the agenda of the Preconciliar Commission during its second meeting on Friday, February 24, 2017. See related story. 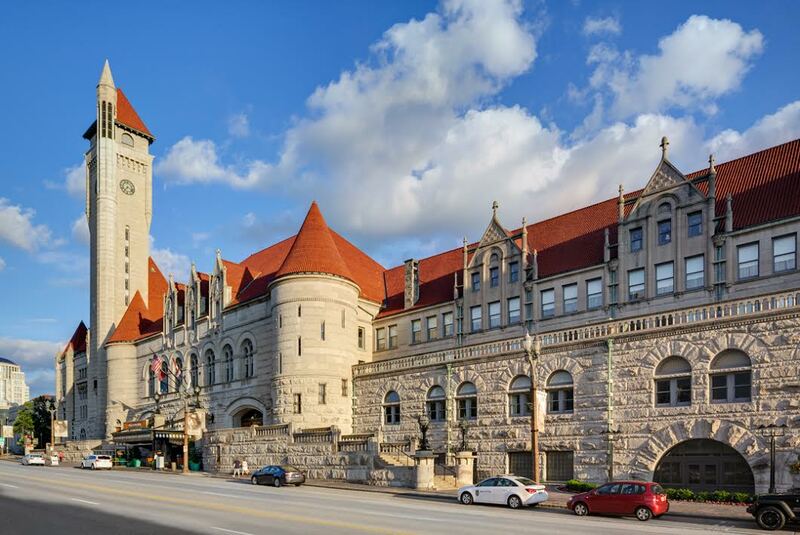 The 19th AAC is slated to convene July 23-27, 2018 at Saint Louis, MO’s landmark Union Station Hotel. In his opening reflections, His Beatitude, Metropolitan Tikhon emphasized the importance of involving youth in the Council in a meaningful way. He also offered insights into proposed themes and the AAC’s general operations. Archpriest Eric G. Tosi, OCA Secretary, reported that a proposed theme and logo will be presented for approval to the members of the Holy Synod of Bishops at their March 2017 Spring Session. He also reported that a contract had been signed for a dedicated AAC web site, slated to be launched this summer. Related AAC projects in process include a video on the Council theme, diocesan videos, possible workshops themes, and a host of functions including a breakfast for clergy wives and a breakfast for youth and the members of the Holy Synod. He further noted that the Sitka Icon of the Mother of God and the Myrrhstreaming Icon of Saint Anne will be present during the Council, as will the reproduction of the Tikhvin Icon of the Mother of God recently enshrined in Chicago’s Holy Trinity Cathedral. AAC attendees also will have an opportunity to view artifacts from the Metropolitan Museum at Saint Tikhon’s Monastery, South Canaan, PA.
With regard to communications, daily video updates and live-streaming of AAC plenary sessions once again will be made available. Deacon Peter Ilchuk reported on the finalization of additional contracts, coordination with the Local Committee, and other matters related to the planning process. Archpriest Timothy Sawchak and Robert Butchko, clergy and lay co-chairs respectively, noted that all local committee chairs have been filled and that the response for volunteers has been strong. Melanie Ringa, OCA Treasurer, reported on the current budget for the AAC. She related the recommended finance plan that involves billing each diocese for AAC assessments directly, rather than billing individual parishes as in years past. She stressed that parishes should budget appropriately for AAC expenses. Fees were set for AAC observers and other attendees, although retired clergy and widowed clergy wives will no longer have to pay a fee to attend. Priest Benjamin Tucci outlined the proposed youth program. He will begin to recruit and vet volunteers in the months ahead. A database of youth delegates is being planned. Potential donors to offset the cost of the youth program are being explored. Becky Tesar shared plans for the Fellowship of Orthodox Christians in America’s annual convention, slated to be held concurrently with the AAC. Protopresbyter Leonid Kishkovsky related his conversations with some of the recommended AAC speakers, while a list of ecumenical and interchurch observers was reviewed. Additional information will be made available after the Holy Synod of Bishops’ Spring Session.